Today I’m gonna #BRINGTHEBOOM to your Game Day party! Or your Oscar party. Or your family game night. Or, really, just because! 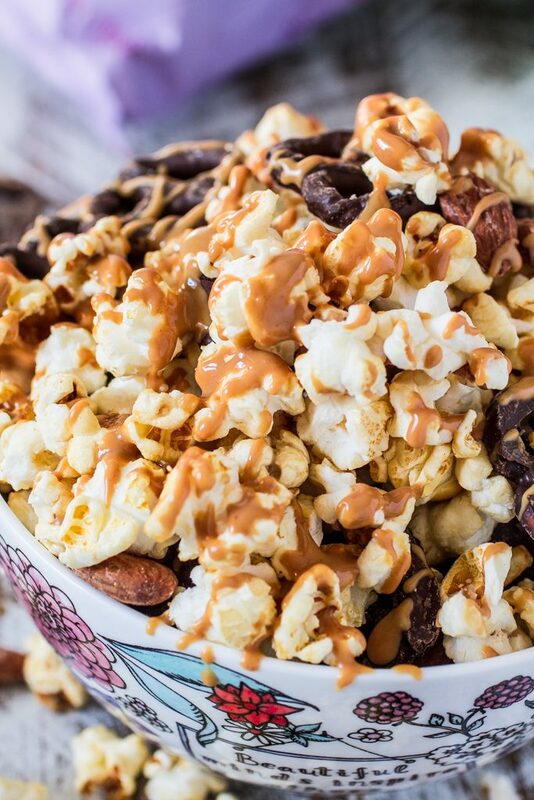 After all, who needs an excuse to eat something as delicious as this Popcorn Party Mix? And the best thing is that there is no cooking involved. All that there is to it is mixing the BOOMCHICKAPOP popcorn with dark chocolate cover pretzels and roasted almonds. Oh, and, of course, drizzling some melted peanut butter as the final special touch! ? No cooking, no fuss and a whole lot of time to enjoy the football game and the company of your friends! I think that by now you guys know me enough to know that football season is all about the food for me. I’m not one to say no to all the wings, nachos, potato skins, dips and all things delicious. But I also believe in moderation, so if I’m the one hosting a party, I make sure I have a healthy alternative to all that fried goodness. That doesn’t mean I’m going to serve celery sticks, though. It has to be something equally delicious and fabulous so you won’t even care about that huge plate of hot chicken wings! And for me that’s popcorn! Angie’s BOOMCHICKAPOP is as much fun to eat as it is to say. They’re not only low calorie, but also gluten and cholesterol free, vegan and have no artificial ingredients! And they come in 8 different flavors: Sweet & Salty, Lightly Sweet, White Cheddar, Salted Caramel, Caramel & Cheddar, Sweet & Spicy, Sea Salt& Vinegar and Sea Salt. I know what you’re thinking: “How on earth could I pick just one?” And the answer is: You don’t! You buy them all! ? 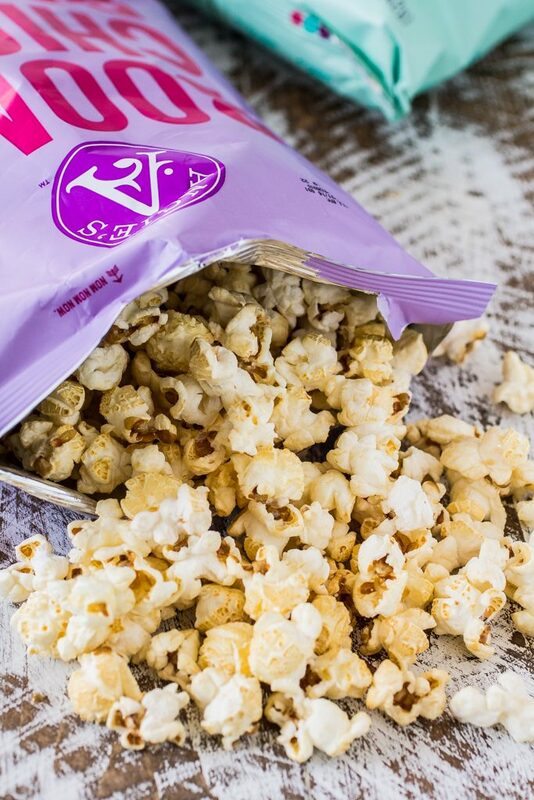 Once you open one of these bags, you will be tempted to just eat the whole thing and skip the party mix, since this popcorn is so good. But I say give the mix a try! 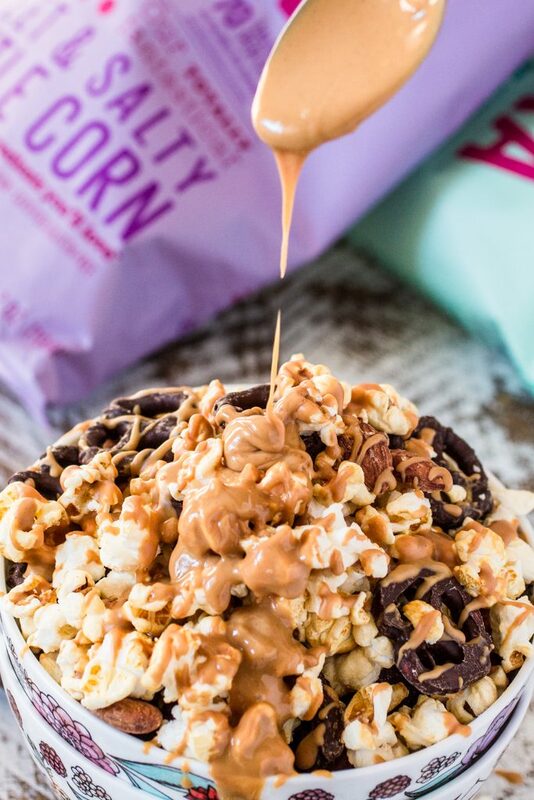 Because there is only one thing that is better than popcorn, and that is popcorn mixed with almonds, chocolate covered pretzels and melted peanut butter. Ha! Gotcha ya! There is no such thing as too much peanut butter! ? But, of course, feel free to adjust amounts according to your taste. I put together a small recipe below, but you can – and should – make it your own! Oh, and before I forget: BOOMCHICKAPOP is hosting an awesome giveaway. How does it work? From January 21h to February 10th, simply share a photo of how you bring the BOOM to Game Day on Instagram, Facebook, Pinterest and/or Twitter, using the campaign hashtag #BringtheBOOM. BOOMCHICKAPOP will randomly pick 5 winners who will receive Game Day Kits containing a PINK Angie’s grill, grilling utensils and a pink travel chair! Seriously… a pink grill? Count me in! Just mix all the ingredients and drizzle the peanut butter on top! That looks unreal, wish I could buy it here too but I’m afraid I’m not that lucky! Boom Chickapop is my favorite! Oh how I love peanut butter! This looks amazing! Thanks for sharing! Mmm this looks so good! Yes there can never be enough Peanut Butter!! I’ve been on a popcorn kick lately, so this is right up my alley! I love popcorn! I will certainly try to make your recipe!